Why should we care about a building’s energy consumption? From the 9th to the 11th of September the Solar Energy and Buildings Physics laboratory is hosting the CISBAT conference. This international meeting is seen as a leading platform for interdisciplinary dialog in the field of sustainability in the built environment. More than 250 scientists and people from the industry will be at EPFL in Lausanne to talk about topics from solar nanotechnologies to the metabolism in urban districts. But how is this related to Atmospheric Science really? As you might know, this year the United Nations Climate Change Conference COP21 meeting will be held in Paris and the focus is to try to limit the global temperature increase to 2ºC. Switzerland has already submitted its proposal regarding its future emission and aims at reducing it by 50% by 2030. Many other countries have done the same, but NGO’s are saying that the most important greenhouse gas (GHG) emitters are not going far enough in their proposals to limit the temperature increase. So what are the sectors where we can decrease our energy consumption, improve the efficiency and decrease our GHG emissions? If we look at France for example, the building sectors consumes about 44% of the final energy use. 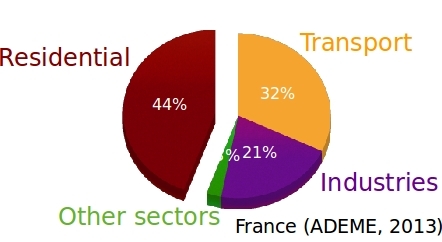 From these 44%, around 70% is used only for the thermal comfort on the occupants. This conference is also an official presentation platform for the Swiss Competence Center for Energy Research “Future Energy Efficient Buildings & Districts” (FEEB&D). 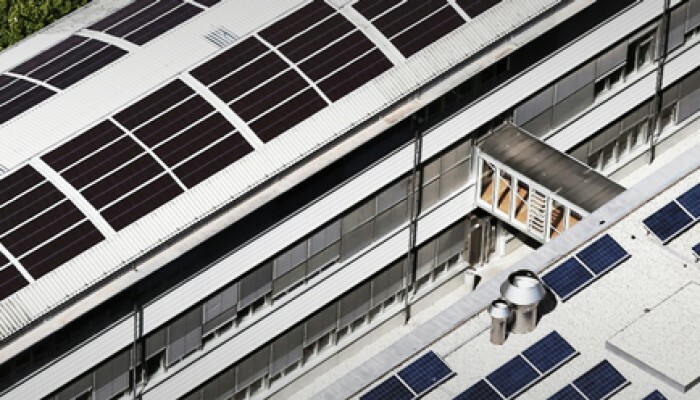 This project aims is to reduce the end energy demand of the Swiss building stock by a factor of five during the next decades thanks to efficient, intelligent and interlinked buildings. From the figures above we have seen that there is here a huge potential to decrease our energy consumption. First we can improve the insulation of the buildings to enhance their efficiency. Several countries have implemented financial incentives to incite renovation but have also introduced tighter thermal regulations to decrease energy use in new and refurbished buildings. In this conference, we will also be talking about the integration of renewable energies (RE) (solar PV, thermal, algae, wind, …). The idea of course is to improve the penetration of RE in urban areas so as to decrease our dependency on fossil fuels and hence of course reduce our GHG emissions. In order to reach this objective, it is then necessary to optimize their installations in order to see how we can reach the greatest autonomy possible with RE and the usage of storage solutions. Among other subjects that will be presented during this meeting are model predictive control and daylighting and electric lighting. We will also address some issues related to urban simulation (you can have a look at a former blog post on this subject) / ecology and metabolism. Have a look at the CISBAT website and follow us on Twitter. I will also try to LT the conference with #cisbat15.